The TARDIS isn't hard to get right as a toy. After all, it's just a big blue police box. But there's a difference between getting it right, and doing Doctor Who's iconic time ship justice — and Big Chief's 1:6 scale replica definitely does the TARDIS justice. Based on the Tenth Doctor's TARDIS, the nearly 20" tall model is designed to go with Big Chief's line of 1:6 Doctor Who figures (like this unrepentantly grumpy Tenth Doctor), but on its own it's a wonderful display model. Packed with LEDs to dimly light the interior as well has have the lantern on top of the TARDIS pulsate like it's ready to dematerialise, it also comes with a set of swappable interiors so you can create the console room's various appearances between series 2 and 4 (which is essentially just lighting changes, but it's still nice to have!). Like I said, the TARDIS can be so simple to get right, but Big Chief's model is just so wonderfully detailed that you can't help but stare at it and admire all the little touches. The occasional scuff here, the wood texture there, the raggedy telephone sign. It's a beautiful replica. It also comes with some Tenth Doctor bonuses if you order directly from Big Chief, too — a pair of pyjamas and slippers to dress your Tenth Doctor figure in to recreate his appearance in The Christmas Invasion. I kind of love how fantastically Doctor Who-ish that is. "Giant police phone box and some pyjamas? Slippers too!? Bargain, where do I sign up?". Of course it means if you don't have a Tenth Doctor figure it's just a free set of tiny clothes that are of no use to you, but still. 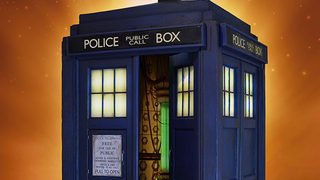 The 1:6 TARDIS is available for preorder now, ahead of a release in November. Want a blue box (mad man not included) of your own? It'll set you back £270, or around $400.